All these blessings which God gives to us, including the earthly blessings of marriage and parents and good government, all these riches that are ours in Christ the Devil, the World and our own sinful flesh wish to take away from us. Why because they think the riches of this world and of sin are better. This is of course utter foolishness. In Africa I spent some time at this village in the Congo. This village used to be the bread basket of the Congo. Trains came daily. There was plenty of work and food for all. It was a prosperous and thriving city but the Africans were jealous because the man in charge was a European. So they rose up and took his land from him. The fields fell into disarray, the trains stopped coming, even the nice houses that the wealthy man built for his workers were abandoned and left to fall apart. We think we can get more through sin, but we end up with nothing. Therefore in order to give us the means to protect the riches that Christ has given us, he also gives us the full armor of God. It’s not for nothing that Satan is called a great serpent, a lion, a dragon. He is a fierce and dangerous enemy. And there are many on his side: “principalities, powers, the rulers of the darkness of this age, spiritual hosts of wickedness in the heavenly places.” Unfortunately Satan greatest power is his lies and his deception. If his attacks were physical, we would be so quick to do whatever was necessary to oppose him. If he was trying to burn down our house, or steal our land, or break into our bank account then how quick would we be to pick up a gun or call the cops or do whatever else we could to oppose him. But his greatest attack is not to burn our house, but four simple words, “Did God really say?” And because of that we don’t really take his power or his threat seriously. Well I know the truth; he’s not going to get me. What foolishness! What foolishness! We do not understand the value of all the riches that Christ has showered upon us. Against Satan’s attacks not one of us could possibly stand, but the Lord gives us Strength. Stand in the power of his might. I don’t mean in any way to underestimate how hard farmers work. But it is not your strength the plows the field and harvests the grain. The strength is in the tractor. You can sit up there in the cab on top and plow huge fields, because the strength is the engine of the tractor. Thus we could do nothing against Satan but would daily crumble and fall before Satan unless we are encased in the strength of Christ. 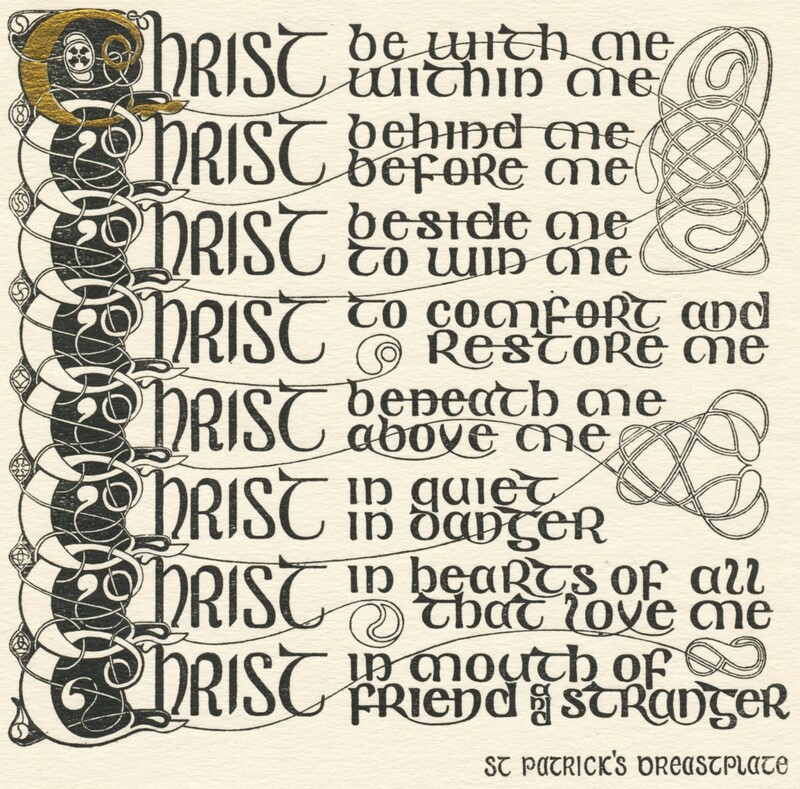 For that reason the passage of the week this week is not passage but is the “Breastplate of Saint Patrick.” A prayer that reminds us to stand in the strength of Christ. Notice our goal here is not to conquer the enemy that has already been done for us. Our goal is simply to remain standing in Christ. Modern Christians usually view their life as a ladder. They think they always need to be climbing closer to God. But that is very depressing because we never feel like we make any progress. We always feel like here I am the same sinner today that I was yesterday. But the early Christians knew better. Their view of a Christian life was a ship at sea. The goal was just to remain standing. Sometimes in life the sea is rough and stormy and sometimes its smooth and easy. Often you get knock down, but even when you get knocked down your on Christ. Your held by his power from the waves and the sea. We might not ever make any progress against Satan and his forces. We might even get pushed backwards, but in the strength of Christ we continue to stand against him. In this fight we cloth ourselves first with truth and righteousness. That is we refrain from sinning with our lips and our actions. When we keep our lips and hands from sinning we are beyond approach and protected from the attacks of this world. When we speak truth and do what is right and good we receive honor even from this world. Mat 5:16 16 “Let your light so shine before men, that they may see your good works and glorify your Father in heaven. However this is the least important of all the armor. It can protect us some, especially from the attacks of this world, but if we rely on it too much it is easy for Satan to find chinks in that armor. He can cut our arms off or our legs from under us, then we are left like the black night. This is why the real protection comes later in the shield of faith. This is also why we need to daily confesses our sins before our Father and receive the forgiveness He gives through Jesus Christ, then Satan has nothing left to accuse us of. A good shoe gives you a good footing, so that you can stand. When we went camping over Labor Day weekend the river that ran along our campsite was filled with rocks. It was very difficult to walk out into that river. I kept wishing I had some of those water shoes, then I could have easily stood and walked in that river. The Gospel, the good news that Jesus died for my sins, gives us that sure footing. Yes I’m saved because Jesus died for me. If we place our trust in any other thing, my works, well I go to church, I’m a pretty good person, or my understanding, then we are going to get pushed around and battered and swept downstream. Jesus died for me. The gospel of peace that gives us a sure and certain footing. Paul agrees faith is a far better defense than my righteousness. The Greek word for shield used here is the same word for a door. This was high solid shield of iron. You could crouch behind it and nothing was going to get through. Satan says, “you’re a sinner” – Faith says, Jesus died for me. Satan, “everyone thinks you’re an idiot” – I trust Jesus more than men. Satan, “your going to die someday, don’t you want to have fun while you can” – I’m going to heaven. To say faith is your shield is really the same as saying Christ is your shield. Faith is merely holding up Christ. Satan can’t get past that, even with arrows which are lit on fire. Of course it also helps to remember where we are going. Keep our eyes firmly fixed on our salvation. A helmet allows you to look over the shield, otherwise all you can see is the ground in front of your feet. Keeping our eyes on our salvation keeps us looking up and forward instead of focusing on the momentary problems of this life. We don’t have to only play defense. We can cut Satan down where he stands by using the Word of God, as Christ did when he was tempted. But it means practice. It means using the Word of God and learning what it says. Otherwise we won’t know how to use it, and then all we can do is cower behind our shield. 18 praying always with all prayer and supplication in the Spirit, being watchful to this end with all perseverance and supplication for all the saints– 19 and for me, that utterance may be given to me, that I may open my mouth boldly to make known the mystery of the gospel, 20 for which I am an ambassador in chains; that in it I may speak boldly, as I ought to speak. In every situation, in every temptation, in every pain and sorrow, pray in the spirit. All you have to do is ask. A certain member thought the key in the lock box was put there to keep kids out of the gym. But it was put there only to keep the kids safe during school. All you have to do is ask, and you can get the key and go in and use the gym. Much more so all we have to do is ask our Father, and his answer is always yes in Christ Jesus. Most especially pray that your pastors and teachers, and all called workers will be given the strength and wisdom to open their mouths and proclaim the Gospel of Christ. This is the number one thing you can do to help with the work of the church. We need your prayers, because we are also weak and filled with sin. Pray for us that the strength of the Lord would be with us. Psa 51:15 NKJ O Lord, open my lips, And my mouth shall show forth Your praise.